We’ve analyzed and dissected what it means for the Cards to have Matt Leinart starting at quarterback this season a bunch of times already, and training camp hasn’t even arrived yet. But hey, it’s the summer. The players are gone. So here’s another thought. SI.com has a story posted today about the “Rule of 26-27-60” as a guide (although not a guarantee) of NFL quarterbacking success. And, according to the rule, Leinart should work out. The idea? If a guy scored at least a 26 on the infamous Wonderlic exam at the combine, had at least 27 college starts and completed at least 60 percent of his collegiate passes, usually, it means the guy can succeed on the NFL level. Leinart scored a 35 on the Wonderlic. He started 39 games in college. And he completed 64.8 percent of his passes. Check. Check. Check. Among current names that also accomplished all three parts of the “rule?” Both Mannings, Philip Rivers, Tony Romo, Matt Schaub, Drew Brees. Among the names that fell short in at least one category? Ryan Leaf, Akili Smith, Tim Couch, David Carr, Joey Harrington, JaMarcus Russell. Now, there are always exceptions. Ben Roethlisberger, Joe Flacco, Donovan McNabb and Brett Favre have all done pretty well. And you may not be printing Super Bowl tickets if Ryan Fitzpatrick or Kyle Orton (both of whom reached all three benchmarks in college) is your QB. But it’s a talking point, and one to consider. Until gets a chance to wed significant playing time with his acknowledged more mature preparation methods, we won’t know for sure either way. UPDATE FOR THOSE WONDERING: Here are the numbers for the other QBs on the roster, again with the caveat that this “rule” isn’t the end-all-be-all. Derek Anderson 19-38-50.7, John Skelton 24-41-58.8, Max Hall 38-39-65.3. I cannot wait! Let’s get this season started already! I believe Matt Leinart will do very well! 2010 is your year Matt Leinart to make it or break it. I hope you make it and we are set at QB for a decade. Running game and offensive line will never be better for Matt so this is the year he has to do it. People need to just read the very last paragraph, and chill out until the season starts. Were going to be really good in my opinion, I think Matt has learned how to play in the NFL and is ready to do so. It is my hope that he will do half as good as my favorite lefty, Kenny “The Snake” Stabler, somthing about left handeed QB’s. Give em hell Lienart. Matt Leinart will have a breakout season. Hence leaving The Cardinals set at QB for years to come. Skelton is a little short on two of them and Hall blew them all away.. Interesting.. I’m excited about Skelton’s big arm but Hall is more intriguing to me. For whatever in the world that’s worth. training camp can’t get here soon enough. I wanna see if these young guys are ready to step up and play some smash mouth football. Look out for beanie this year… Hopefully whiz unleashes his monster this year and gives beanie a decent amount of carries. Its been a long summer so far with the Dbacks stinkin the joint up and PHX losing amare to free agency. C’mon cardinals, your all we got!! I agree with you ditship. I like Hall a lot. the kids got it all…except the size of a prototypical quarterback but i would hope that size wouldnt matter (at least in this case) because hes got everything else you want in an nfl QB. Also consider the level of competition, quality of the line and receiving corp in how those numbers were accumulated…it could shift the validity of the numbers (save the Wonderlic) for and against any of the QB’s….but it is interesting to think about. In the end I think it comes down to leadership, heart, preparation and that “clutch” factor. I fully think the biggest problem with Matty was his approach to the game from a mental stand point. He never prepared well or seemed to me to take the NFL very seriously. Had a few good plays and games his rookie year then broke his collarbone, and you all know the rest. I dont think things could have worked out any more perfect for him. Just look at the total change in attitude and preparation. Our team has had time to get better around him, while he had some time to grow up a little bit. Beanie Has been here this whole offseason and I know he will have Matty’s back just like the rest of our team will. YEAH MAN I CANT WAIT!!!! GO CARDS!!!! Matty is ready. I can’t wait for training camp so I can go and see how he does in the workouts. and PHX losing amare to free agency. C’mon cardinals, your all we got!! Isn’t it nice that the valley still has one respectable pro sports owner in Mr B. The Wonderlic is a application available, but much like 40yd times, vertical jump and bench presses are really not indicative of the player’s possible NFL career. Marino, Kelly and McNabb all scored under 20 yet seemed to do well. In the Cards division, Alex Smith scored 40, Sam Bradford 36 and Matt Hasslebeck 29. So following that reasoning, if Anderson plays, Arizona is doomed. First of all, this is coming from a 49er fan. You guys are really lucky to have Max Hall in your organization. He is an amazing QB. Even though he is short, he still has the will and way to win. He is very much like Drew Brees and Tom Brady, first they did not (especially Brady) impress many people at the draft like the Mannings did, but when they showed their true potential, they won Super Bowls. Max Hall is coming from the QB U where Steve Young, Jim McMahon, Robbie Bosco, and Ty Detmer have come from. He set the records for a QB at BYU. He will help you guys win lots of games and will win you Super Bowls. I think with how great Max Hall played in college and in rough times how he carried his BYU team that somehow someway he will wind up quarterbacking the cardinals. It may not be until it comes to him competing w/ Skelton and Leinart going down w/ injury but this kids gonna be the next Kurt Warner! i think matt needs to take a back seat on the leadership aspect of quarterback he should let others take the lead until he proves himself by guiding the offense. He should lead from behind by being respectful of the veterans and showing confidence in them. he has been in the program a long time but if he comes in acting like everyone should listen to him he will cause problems. he just needs to get in there and be the quarterback. the team is strong enough to lead itself until he gets his training wheels off. i think he is about to have some flashbacks to his college football days when this team begins rolling with him. he aint a kid anymore but this has the potential to be one of the most fantastic years of his life. Good luck Matt we are all pulling for you. I have to disagree. An offense needs a quarterback to be a leader. That’s what they are expecting. It’s a fine line — he can’t be arrogant — but he must lead. It was in this article out of Green Bay. Matt, will do just fine. He was tutored under one of the greats–Kurt Warner for about 4 years. He is ready to take command!!!!!! Says a lot of Max Hall. And as Urban noted, I would not be thrilled with Ryan Fitzpatrick as my starter, but he is a very good backup. If Max Hall turned into Fitzpatrick that would be yet another weapon the Cardinals possess. I am 50/50 on Matt, I was huge supportor when he came out of USC. It’s his team no and he has to make good on it…I am really high on hall…Toatl underdog, call me crazey; but; if things go south with the Qb’s I could see him starting the last two games….Just a thought…Cards have the talent to win all comes down to to #7….Go Cards!!! Anderson only had a 19 on the Wonderlic? That is what I found in multiple places, like this one. Hall looks like the real deal. Gotta believe he’ll find a spot. I think he’ll do just fine. He does of course have the best in the biz! I can reference it! Maybe the great Octopus can tell us if he will succeed?! lol Season tix being mailed out today! Matt has couple of years in the NFL now,Not like the other teams just berally getting their quarterbacks from college. Matt show them how it”s done in the NFL. GO CARDS!! FROM 1 OF OUR FANS FROM EL PASO TEXAS. do well in 2010, get rid of him and get someone who can get the job done. I hope he steps up to the plate and the Cardinals are back in the Super Bowl again. If he can do the job, great! I agree with ditship and Joe Daddy…. Max Hall blew the “Rule of 26-27-60” away! Who cares about his height Drew Brees is the same exact height and he just got a ring! Max Hall will bring more heart to his game then Skelton will… he has to he has a wife and kid to support! GO Matty and Go Max…. the only 2 QB’s who apply to the RULE on our roster! Also Darren, quick question… do injured plyrs. give us a exception to the only 80 rule for trng camp? The only way an injured player does not count on the 80-man limit is if he is placed on the permanent physically-unable-to-perform list as camp starts. That would also mean he cannot play in the first six games of the regular season. There is a non-permanent PUP list, but the player would count against the 80-man limit. Anyone else counts — for example (and this is just an example, not news) if DRC were still rehabbing from surgery for most of camp, he’d still count against the 80-man limit. 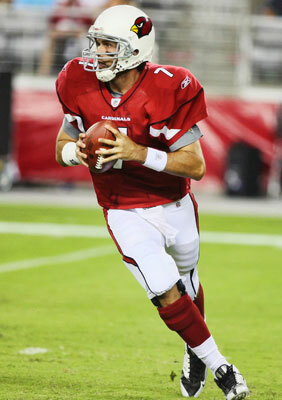 Leinart will be a BIG success.He has learned a lot from Kurt.GO CARDNIALS!!!!!! I am a math teacher, so the little math predictor was nice! In any case, it really all comes down to this season. If Matt Leinart can lead this team, then the Cardinals will be successful probably until Fitz retires, assuming we don’t let everyone go to other teams as we did this past year. If he doesn’t succeed, well then there are some real questions out there and something needs to happen because it’s not often that your team is this set-up offensively. I’m looking forward to this season as a predictor of future successes! So where is the list of QBs that meet or have met all those criteria, but are or have been mediocre at best or complete busts? Not at all to suggest Matt won’t do well – I think he will. I like the postive feedback the fans are giving Matt. I think its his time now. I think he will play well and help lead us to the division crown once again. I support Matt 100%. I just bought a Matt Leinart pennant and pinned it up in my garage, I have your back Matt. Lets go CARDINALS!!!! !